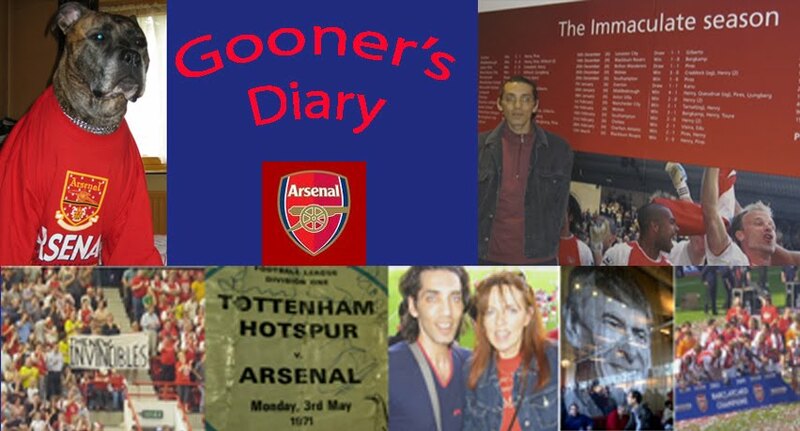 Gooner's Diary: All Arsène Wants For Xmas.....? It was adding insult, to injury, to finally get back in the car at Euston on Sunday night, after the long train journey back from Manchester, only to hear Arsène on the radio, banging on about offside, as if the two disastrous defeats of the past week were purely down to some sort of nefarious "they're all out to get me" conspiracy by the officials. When we all know full well that we've been subject to officiating that is no more incompetent than at any other match and that this finger pointing is merely the same ingracious and frankly feeble attempt to divert attention from the real issues at hand, as is always the irritating habit of our autocratic manager, in his exclusively privileged position of not having to answer to anyone for more pertinent failings, far closer to home. As the Gunners' campaign implodes in the blink of any eye, it's usually around this time of the season when I'm most often reminded that if it wasn't for the cathartic benefit of being able to vent my frustrations, in truth, instead of posting individual weekly missives, I could easily rotate a meagre stock of around half a dozen different diary piece templates and simply amend the facts to suit the specific occasion. We might enjoy the occasional tease, where events on the pitch provide a glimmer of optimism that the Gunners have finally escaped our Groundhog Day existence, but sure as eggs is eggs, it's always only a matter of time before this balloon is burst and it becomes self-evident that there is no reprieve from our lifetime sentence of cyclical non-fulfilment. Whether or not David Silva was standing offside when Sterling beat Petr Cech at his near post, or whether Sane's big toe was offside when Silva put him in on goal for the equaliser, I certainly don't hold Martin Atkinson responsible for Sunday's defeat and the main source of my anger is not the ref. What seriously pisses me off is that with Conté's Chelsea churning out wins, like genuine title favourites and with us going into this match a massive nine points adrift of the cowboy outfit that Abramovich told Santa he always wanted, the world and his wife knew that if we were to have any hope of clinging to Chelsea's coattails, the Gunners badly needed to lay down a marker of intent against Man City. Following the feeble manner of our demise at Goodison, we needed the sort of performance that would silence all those who'd returned to the age old question of the Arsenal's soft underbelly, by proving that we've at long last evolved from habitual 4th place also-rans, into genuine contenders. Instead of which, after having given us all false hope that an "eff off" win was on the cards, when we scythed through a patently inadequate City defence (as evidenced by the number of goals shipped against all and sundry! ), like a knife through butter, in our first attack on goal in the fifth minute, much as we did after grabbing a far more fortuitous lead at Goodison on Tuesday night, instead of pressing home this advantage, fatally, the Gunners were culpable of taking their foot off the gas. Who knows if this is down to conceit (believing we can always score another, if needed), complacency, or fatigue. Yet no matter the cause of any such mental weaknesses, when one considers our new Kiwi psychologist's former rugby clients and the renown of the All Blacks for relentless ruthlessness, (unless you count an improvement in Theo's attitude) Ceri Lewis certainly doesn't appear to be earning his corn at the Arsenal as yet. On the pitch, mercifully Mustafi appears to have brought some much needed grit to the Gunners party. Yet in Shkodran's absence, sadly we seem to have returned to being a side that is all too often capable of rolling over, for the want of some vocal "stand and deliver" authority. Just how often do we have to suffer the bitter taste of blowing a lead, before we learn the costly lesson of the difficulties in shifting up through the gears, once a side has slacked off and sacrificed all momentum and intensity? Moreover, although personally I refuse to swallow all the hype surrounding Guardiola and have witnessed nothing to suggest that City's new gaffer is blessed with some sort of tactical superpower, with Pep having experienced the Gunners make relatively light work of containing a City side deprived of the likes of Aguero, Gundogan and Fernandihno during the first half, in contrast to our stubbornly unyielding pensioner, City's gaffer did at least shake things up with their lineup after the break, in an effort to present us with a different problem. Instead of berating the officials, as far as I'm concerned, Wenger would earn far more respect if he questioned his own impotency on the bench. From our perspective, high up in the gods, behind the goal that we were forlornly hoping to see the Gunners attack in the second half at the Etihad, it fast became blatantly obvious that with the listless body language of the likes of Özil and Xhaka, we would struggle to stem the tide of sky blue pressure. With City equalising only two minutes after the restart, frankly it didn't take a genius to realise that in spite of returning to the pitch several minutes before our hosts, this was only because we were eager to get the game over and done with. If the determined spirit of togetherness that Arsène so often remarks upon, truly existed in this Arsenal squad, then surely they should've spent the break stoking the fire in their bellies, reminding themselves that they had quietened an already anxious home crowd with the opening goal and that they had a perfect opportunity to silence them permanently, by starting the second half with the concentration and commitment necessary to stick the knife in. Sadly, with us seemingly still being devoid of any leadership characteristics, we commenced the second forty-five much like we finished the first, as if we could sluggishly continue going through the motions, thereby gifting City the goal, which got the home crowd's gander up, leaving the Gunners on the back foot. This is where I struggle most to remain loyal to our vainglorious manager because it seemed evident to me that this situation called for a bold response, with an immediate injection of two or three subs, to overhaul our flagging side and to try and turn our fortunes around. Theo might've scored a great goal and earnestly grafted first-half, in aiding Hector to defend our right flank, but he joined Özil and Xhaka on the missing list after the break and the mere replacement of Iwobi with the Ox was never likely to achieve a sufficiently significant impact. Instead of which, we had to endure the almost inevitable sight of Arsène shutting the stable door, after City's horse had bolted, with Olly only entering the fray after Sterling had scored what would eventually prove to be the winner. This was only marginally more infuriating than the incessant badgering from the home fans beside us, before they and the entire home crowd came back to haunt us, with a piss-taking rendition of our own "1-0 to the Arsenal" anthem. Although it was galling to hear our own red and white refrain continue to echo out from jubilant home fans, as we were herded like cattle, around the metal maze of the crowded queue for the tram back to Picadilly Station, it could've been a lot worse. Wearing my bobble hat and scarf to ward off the cold as the temperature dropped, I was expecting plenty of stick as we inched our way towards the platform. Yet the mood was surprisingly sympathetic and amongst the hubbub of foreign languages from hordes of tourists, I sensed a mutual respect from the more knowledgable City fans. With their campaign no less precariously balanced, perhaps they concluded that the scoreline was merely a reflection of a more pro-active Pep, compared to our reactive Prof? Continuing the bovine theme, my mate proposed we club together to buy Arsène a cattle prod for Christmas. Suggestions on a postcard for who'd be more suited to wearing the back of the Arsenal's panto cow. I imagine there might be plenty more Gooners who'd prefer for Santa to bring him a more chair like electrical appliance? As much as I wish I could attend Arsenal matches as you do, the current form of the team would frustrate me no end. Sure wish I knew why the last month of so of the year brings on such uninspired performances. Where is the leader on the field we need? Sanchez is tireless, but he needs help. Ozil is talented, but has gone missing of late. True title contenders have one or two players that somehow get things done when needed. I've read that the team is better with Carzola in it. If so, then I hope we see a lot of him in the new year. Wenger is taking a lot of criticism for his tactics. Maybe there is something in that. I do know that the two goals they conceded against Everton could have been defended better. Well, half a season remains. There is still time to put a good run together. But Arsenal needs to get better results against the big clubs. I adore Arsène Wenger. When I think of the nearly two decades of comparatively dour football that we endured following the glorious double season of '71 and how privileged we've been to enjoy such scintillating entertainment since le Prof turned up, it truly pains me to witness ungrateful Gooners spouting bile on the terraces, about a man who deserves nothing but our utmost respect, gratitude & admiration. As a result, I would much rather see Arsène go now, than to watch the relationship with our fans sour any further than it has already. Pigs might fly but a lot can happen between now and February and you never know, as I'd love us to finally win the Champs Lg and for Wenger to be able to walk off into the sunset, sticking two fingers up to all those non-believers! However I can't help but look at the likes of Klopp and Conté and be envious of the emotive relationships they have with their players and the crowd. While all our players have the utmost respect for Wenger, I can't envisage them being inspired to go the extra mile, sweat blood and put their bodies on the line to win games for him, in the same way as those players who run over to cuddle Klopp after a goal. It has always seemed evident to me that in the absence of any genuine leadership personalities on the pitch, we've got to have someone on the bench with the ability to galvanise the team (e.g. at half time at City on Sunday, or a hundred and one other occasions in recent times). If Arsène had found a proper vocal captain to lead the team, then we'd have been in clover. But there's little more infuriating than watching us trying to tread water at the Etihad on Sunday, knowing there was no one in that team who was capable of laying into the likes of Özil, Walcott and Xhaka during the second half to get them to pull their finger out and then you look over at the bench, only to see Arsène sitting on his hands, impotently watching the three points slip away, with him looking totally clueless as to a Plan B to at least attempt to turn the game around! If he'd sent 2 or 3 subs on and we'd still lost, I would've at least not felt quite so bad, knowing Wenger had given it a go. But where Guardiola had seen that City had struggled to pose a threat and had rung the tactical changes, Arsène, as always, left it to the players on the pitch to find a solution, only eventually accepting that this wasn't going to happen when it was too late. So instead of sending Giroud on at 1-1, he waited until we were 2-1 down, which as usual proved to be too little, too late. What worries me is that if Arsène does stick around and signs a contract extension, if his team doesn't perform, the atmosphere at our place will become so poisonous that it will make what's gone before look like a Wenger love-in by comparison and I would hate for the relationship to deteriorate, to the point where it completely ruins all our memories of his incredible achievements. I get the distinct sense that even amongst many of Arsène's most loyal devotees, a lot of them have grown so frustrated with suffering seeing the exact same failings resurface season in, season out, that they would know welcome change, just for change's sake. Whether it proves successful, or a failure, it will at least mean that we can savour the thrill of not knowing what to expect, rather than the tedious inevitability of knowing exactly how things will transpire every season!